Having a betting bankroll and knowing how to manage it could be the deciding factor of a successful bettor. Therefore we have explained what a bankroll is, the purpose of it and how you successfully manage it. What is a betting bankroll? A betting bankroll is a certain amount of money you put aside, which is only to be used for gambling (in this case eSports betting). The amount you should put aside depends on a number of different factors such as how skilled of a bettor you are, the amount of money you’re looking to place on each bet and how much money you could actually afford to dedicate. The more money you can afford dedicating, the higher bets you will be able to place. The more skilled you are, the higher percentage of your bankroll can be used for each bet. When deciding the amount of the bankroll, it’s important to understand that this is the only money that should be used when you’re betting and that the goal is to never having to refill this. What is betting bankroll management and why should I use it? Bankroll management for betting is simply the way that you’re handling your bankroll and a way to organize your betting. This way you don’t spend money you can’t afford or end up spending your entire budget on one bet that you thought would be a safe one, but then turned out to be lost. Whether you should use a bankroll or not actually depends on what type of player you are. If you’re just looking to up the excitement with a few euros/dollars every now and then while watching your favorite teams going up against each other, you probably don’t have to bother about this. If you on the other hand are serious about your betting and in it to make a profit, having a bankroll will make things a lot easier for you and could also increase that profit. As your bankroll should never be used for anything other than eSports betting, we highly suggested that you separate your bankroll from any other money that you have. If you’re good with numbers and have an organized mind, you could of course, in theory, keep it all in your head or simply write down the bankroll amount in an excel document. This is however a lot harder than what we suggest. We recommend that you either open a new bank account which you can store your bankroll in or preferably use Skrill, Neteller, Paypal, Bitcoin or any other e-Wallet. 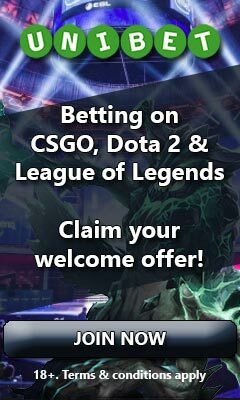 Using e-Wallets is the best option as this will make your life easier when depositing and withdrawing between different eSport betting sites. We therefore suggest that you read our guide about the best e-Wallets for gambling and betting. Another option would be to keep your bankroll deposited at the eSport bookies, but we don’t recommend this at all as it makes it very inconvenient if you want to deposit at a new bookie. It could also be a bit risky if you know that you’re discipline level isn’t always on top, which brings us to our next topic – sticking with your limits, a betting bankroll strategy. Whether we’re talking about professional bettors or professional poker players, they all use a bankroll and they all have one common goal; never bust the bankroll. This is of course not always possible as unfortunately there could be periods where you’re being very unlucky. You should however always keep this in mind and to make a bust as unlikely as possible, you should also set up limits and stick with those limits. Setting a limit simply means that you decide on a percentage of the bankroll that can be used for each bet that you make. The size of this percentage depends on how skilled of a bettor you are as the more confident you would be to win, the higher percentage would you be able to risk for each bet. It is however important that you do not overestimate your skills and to be aware that many professional bettors recommend a betting bankroll strategy that doesn’t use more than 2-5% of your bankroll for each bet. What’s even more important is that when you have decided your limit, you stick with it. Of course there could be exceptions to this rule. Should you have some extremely valuable information that more or less ensures that you will win the bet, then go for it. You would however really have to ask yourself how likely it is that you have such information and could be that confident, especially if you have been running bad lately as this can affect your decision making. Whether you feel confident in a bet or is on a losing streak where you might have the feeling of wanting to win back your losses, it’s important to remember that the purpose of the limit is to follow your betting bankroll strategy to protect your money.